With the onslaught of testing in our education system, I sometimes feel there is a lack of creative outlets for students during the school day. 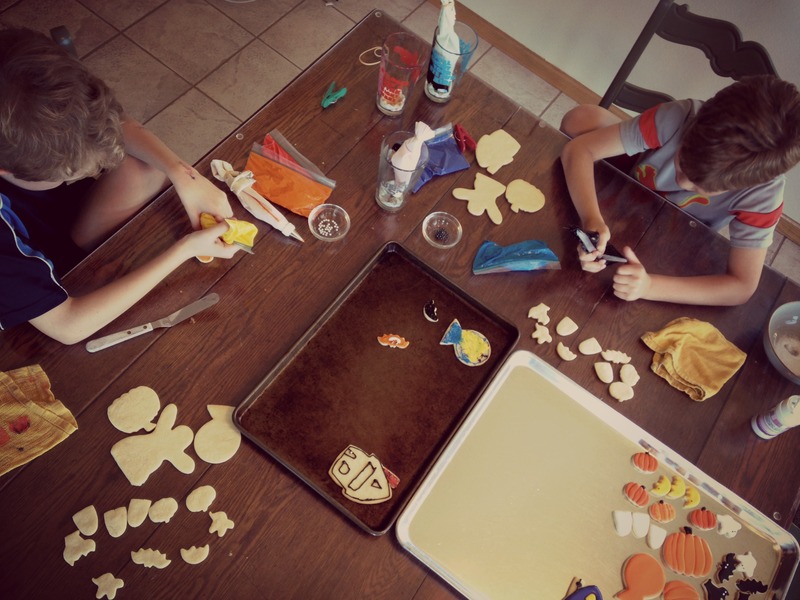 Craft projects, when I was a kid, were a part of our daily routine, not just reserved for art class a few times a week. Making those projects are some of my fondest memories and it saddens me to know that these concepts are falling by the wayside. I’m not saying that the other subjects shouldn’t be concentrated on, but a balance would be nice. 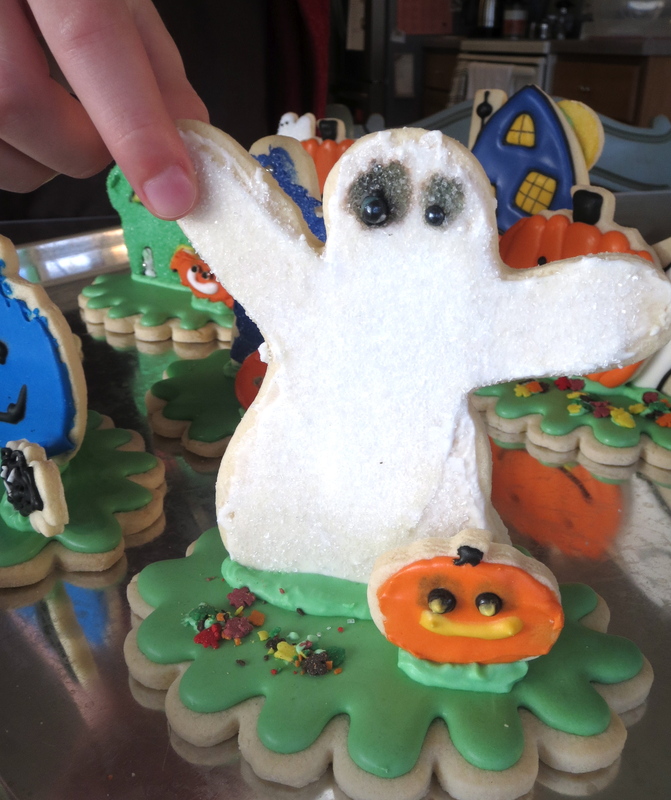 Bake off your favorite cut out cookie in various halloween shapes and sizes. Mix up some frosting, grab the sprinkles and have at it. I put our frosting in snack size resealable baggies with one tip cut off a bit, to keep the mess at a (slighter) minimum. 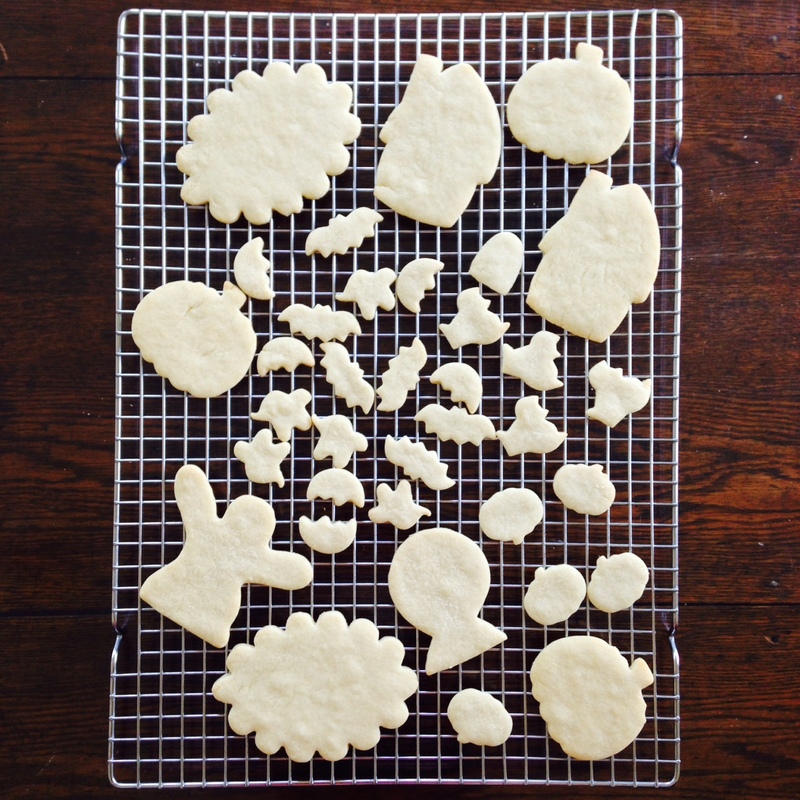 Once our cookies dried, we assembled our scenes by using frosting to “glue” the shapes to the base. 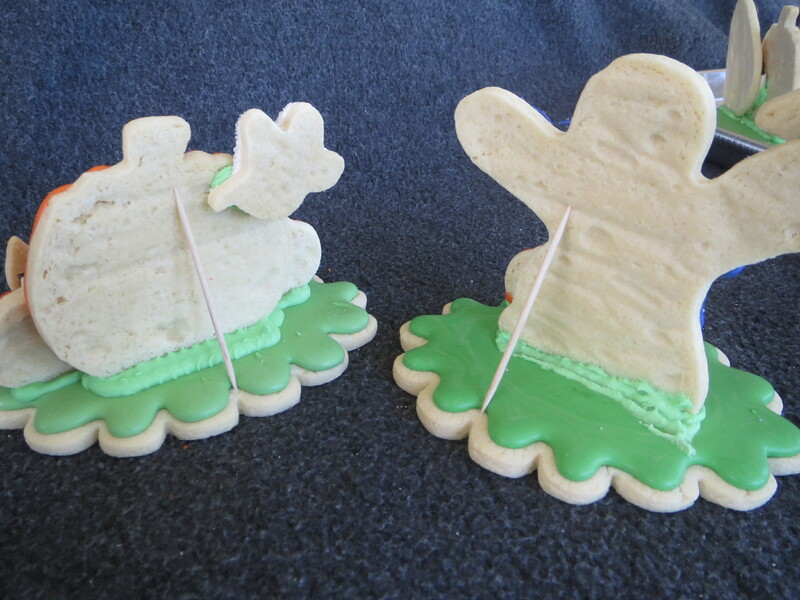 Some cookies needed a little help to stand. I used a microplane to shave off the bottoms and extra support came from the aid of a toothpick. Hey, who says we have to stay with a Halloween theme? My youngest made a green dinosaur out of the ghost shape and had a rocket crash into his house. And nothing beats a blue pumpkin. 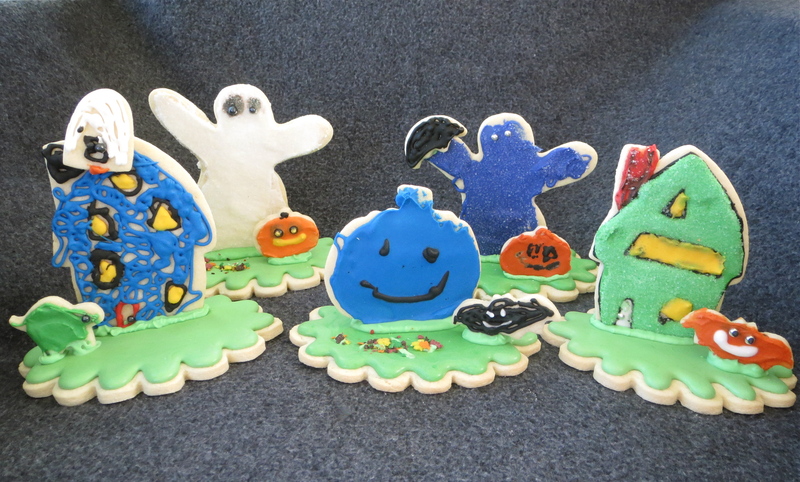 Way to think outside the squash, E.
I’ve decided our creations are part diorama, part gingerbread, and part 3D cookie-licious. Most definitely expressive and fun. I think they enjoyed it, but I may have enjoyed it more. 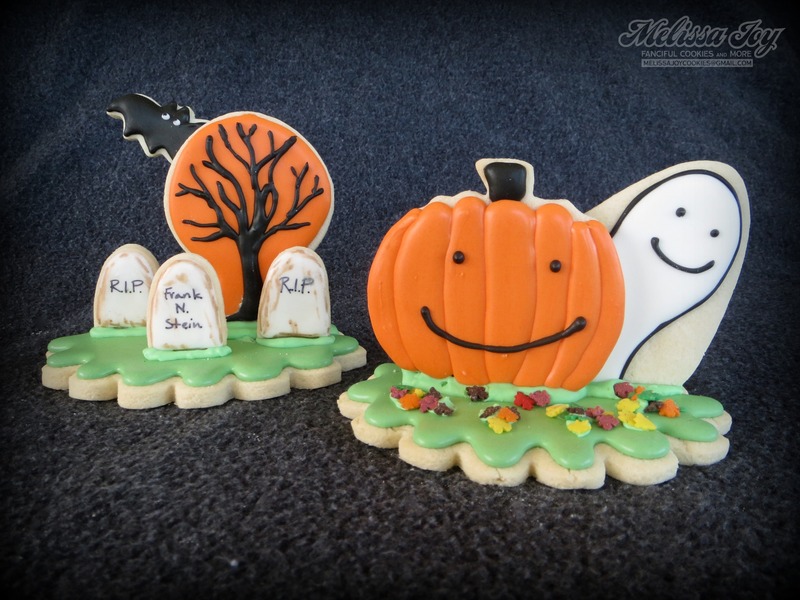 I love this idea and definitely need to do it with my munchkins:) Love the final photo especially, with the entire cookie scene! Fun and fabulous! I made sure to give them an appropriate shout out by adding them to my watermark in that picture. 🙂 Thanks, Sue! 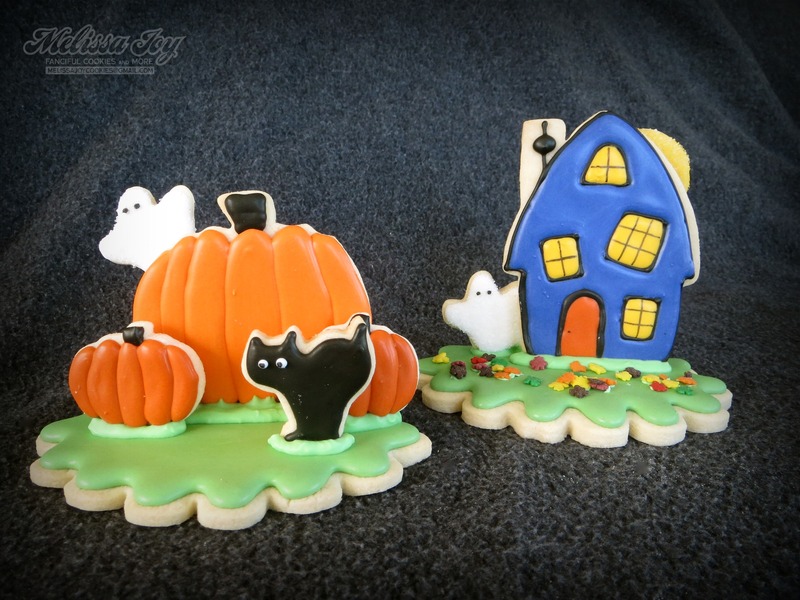 Oh, what a really fun activity and such a cute cookie display!! Your munchkins are already so creative, no doubt the result of your support and encouragement. I can’t wait until my girls are big enough to do fun stuff like this! Thanks so much, Laura! Have fun with it, if you try it!